I love this graphic I spotted on Cupcakes Takes the Cake the other day, courtesy of All Culinary Schools. I'm a stats person so of course this graphic intrigued me. It also lists the history of cupcakes. Looks like cupcakes are here to stay. Enjoy reading! About six months ago I reported on a new cupcake shop to open in downtown Brea. My mom informed me that it's open and delicious! Merely Sweets isn't just a cupcake shop though. They also sell macarons, cookies, puff pastries, and cakes. My mom stopped by a week ago and tried her first macaron. She loved it! Since Merely Sweets is located on Birch Street in downtown Brea, it is open late (yeah! ): 9:00p on weekdays, 10:00p on Friday and Saturday, and 6:00p on Sundays. I stopped by last weekend to sample a little of everything. Want to know what I think? Watch for my full review soon! OC Register Names "The Best of Orange County"
Each year the Orange County Register puts out a publication called "The Best of Orange County." It is derived from a survey where residents of Orange County vote for the "Best (blank) in Orange County." The publication was delivered today and of course the first category I looked at was "Best Cupcakes." For the most part, I can agree with the masses. It's hard to compete with such a large, well-known brand. But it's even harder to compete with Sprinkles when they are so good. Along with their great tasting cupcakes, Sprinkles gives you the experience of a gourmet cupcake. They makes their cupcakes feel special and well worth the price tag of $3.25. One thing I really like about Sprinkles is, along with the dozen or so flavors they offer daily, they sell different holiday and season-themed cupcakes throughout the year. I'm looking forward to trying their Caramel Apple available October 7-31. This shop was bound to be successful with the popularity of the revamped Old Town Orange Circle. The Perfect Circle has become my local shop, as it is only blocks from my house. I love the cream cheese frosting that is present on top of the red velvet, pumpkin, and banana cupcakes. The owner has appeared on the Food Network's Cupcake Wars twice and even grabbed a win the second time. 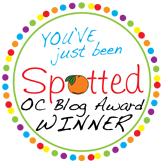 Mixed reviews from readers and reviewers have left me surprised that The Perfect Circle was one of the top cupcake shops in Orange County. Bad customer service and dry cake don't seem to be holding down The Perfect Circle's popularity. Cupcakes are $3.25 each and run out quickly, so make sure you plan your visit accordingly. I've proclaimed SusieCakes as one of my favorite cupcake shops. They offer very simple, very delicious cupcakes. My favorite part about their cupcakes is the dollop of frosting hidden in the middle of the cupcake. Yum! Their cupcakes sell for $3.00 each. SusieCakes doesn't just sell cupcakes though, they have many other delicious desserts too. I love their chocolate chip cookies and have been eyeing all of their cakes for a while. You won't be disappointed! I can honestly say that cupcakes from Meringue Bake Shop are my favorites in Orange County! From the time I reviewed Meringue over 2-1/2 years ago until now, her cupcakes just keep getting better. Meringue Bake Shop currently sells her cupcakes at the Great Park Farmer's Market on Sunday and through direct order. Meringue has differentiated herself by introducing the world to Push Cakes. These delicious treats are modeled after a childhood candy called PushPops and are out of this world! My dream is that Meringue Bake Shop will open it's door at a real shop so I can eat her delicious cupcakes any day of the week! Although I LOVE being a judge at cupcake competitions, it's no easy job. Sometimes there is a clear-cut winner, other times I have a hard time choosing. This was one of those times. There were so many delicious cupcakes at this year's Cupcake Camp OC, so picking my overall favorites was hard. Of course I snuck a few of my favorite cupcakes home with me, to share with my husband of course....well, mostly just so I could eat them when I got my second wind. Turns out my baby belly is the perfect cupcake stand. 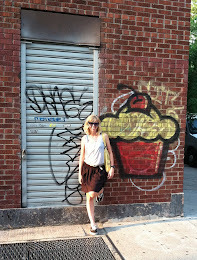 Pretty soon I'll be big enough to hold a jumbo cupcake! Thank you to all of the bakers at Cupcake Camp OC. It seems like this year the best of the best came out. Keep baking and I'll keep eating! 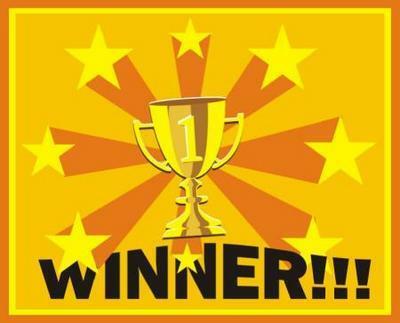 And the winner of the 101 Gourmet Series cookbooks is.....Southern Girl! Congrats! Hurry and email your address to me, so I can get these fabulous cookbooks mailed off to you. Thanks to everyone who entered. I attended the 2nd annual Cupcake Camp OC last Sunday and had a great time! Any time I can get together with other cupcake lovers and eat lots of cupcakes is always a success. This year's event benefitted Children of the Night, a non-profit organization that helps fight child prostitution. This week I'll be highlighting the event, introducing you to the winners, and of course sharing my favorite cupcakes with you. I love the website Hey Cupcake Threads! I want everything on it, especially this cupcake tank. But my life isn't about me right now. I'm most excited about the baby clothing! As you know, I'm 29 weeks pregnant, only 11 weeks from seeing my baby boy. I'm pretty sure my baby will be living in onesies for the first few months. And of course I'm super picky about clothes. But I want, no...I NEED these cupcake onesies. I think they are still boyish enough. 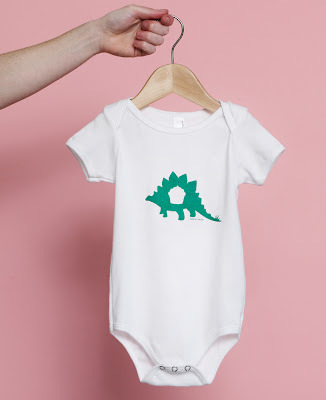 This stegosaurus one is my fav. Must have!! The other day I was picking up dog treats at Target and spotted this cupcake dog toy. She's almost too cute to get mad at. Looks like I need that cupcake toy. Don't forget about my current giveaway for the 101 Gourmet Series cookbooks. Wendy Paul's bestselling 101 Gourmet Series has simplified the task of creating gourmet desserts for every occasion! 101 Gourmet Cupcakes and 101 Gourmet Cookies have taken the home baking world by storm. 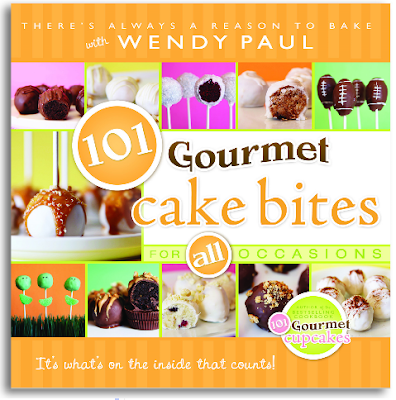 The addition of her newest cookbook, 101 Gourmet Cake Bites, completes the perfect cookbook trifecta. I got my hands on a copy of 101 Gourmet Cupcakes two years ago and I love it! All of the recipes in this cookbook are based off a store-bought cake mix. Perfect for a busy person like me. In honor of the release of 101 Gourmet Cake Bites, I'm giving away the whole series! 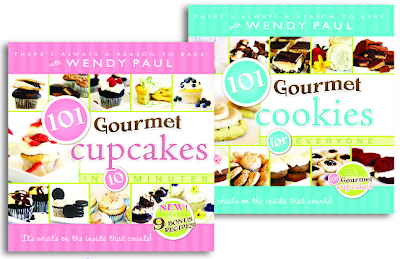 **Winner will be chosen at random and will receive all three books in the 101 Gourmet Series. Contest ends at midnight PST on 9/16/11. US residents only. If you can't wait to see if you're the winner, you can purchase all of the cookbooks on Amazon.com. Each cookbook is approximately $13. 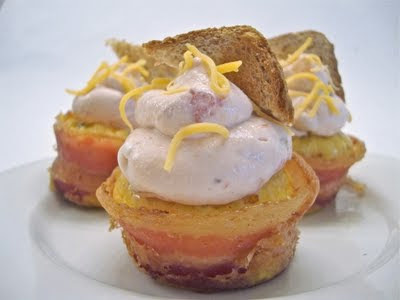 I Heart Cuppycakes recently posted a recipe for a Breakfast of Champions cupcake. Although this cupcake doesn't have any actual cake in it, it still looks delicious. This protein-packed cupcake is made out of bacon, eggs, cheddar cheese, cream cheese, salsa, and bread. You can find the full recipe here. 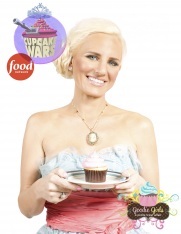 The 2nd annual Cupcake Camp OC is only a few days away and I'm so excited! Not only do I get to taste the best cupcakes in Orange County, I get to hang out with some awesome people too. Annette Starbuck, founder of Goodie Girls Cupcakes and winner of Cupcake Wars. Stefanie Gaxiola, aka "Red Velvet Stefanie" and "Platinum Blonde Chef." She also appeared on an episode of Cupcake Wars. 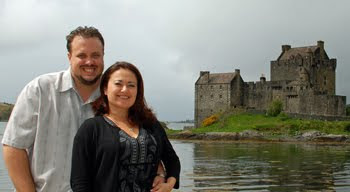 Jason Iehl and Kim Nelson, editors of Saturday Night Foodies and food connoisseurs. I've judged with Jason and Kim at several other cupcake events. They are fun and know their food. You can read more about the judges here. A few weeks ago my husband flew to Denver to race the Leadville Trail 100. It's a 100-mile mountain bike race that climbs up to 12,400 feet elevation. It's a monster of a bike race, maybe one I'd even like to do someday (I'm crazy like that!). Of course I gave him an assignment to bring home some cupcakes. He succeeded. Per a suggestion from Saturday Night Foodies, Lovely Confections Bakery was the place to go. It is located in downtown Denver, on the way to the airport, so my husband didn't have to go out of his way. Of course my husband couldn't just pick up cupcakes for me. He tried them out himself. He wouldn't tell me if he liked his or not until after I tasted mine. Thanks for making my review completely unbiased. I contacted Lovely Confections by Twitter beforehand to let them know my husband was stopping by. They did a great job of making sure my cupcakes were airplane-proof. These babies made it all the way home in one piece. Delivery to my kitchen. I wish I had a cupcake courier for every cupcake shop. The three cupcakes from Lovely Confections that I tried were Red Velvet, Bees Knees, and Chocolate Salted Caramel. Red Velvet: I always use red velvet as a standard for a new cupcake place. Lovely Confections passes the red velvet test. The cake had a decent moistness and wasn't bright red, so I knew it was a true red velvet cake. The cream cheese frosting was tangy, as it should be. Proportion of frosting to cake was 1:3, which meant there was a lot of frosting. I didn't mind. Bees Knees: This lavender cake also had decent moistness. At first I was a little put-off by the flavor because I normally associate lavender with soap. After a few more bites, I began to enjoy the cupcake how it was meant to be. The honey lemon frosting was "buttery good." I think I wrote this because of the strong butter taste, which is a good thing. The frosting had a good, thick consistency. Chocolate Salted Caramel: My favorite of the three! The chocolate cake was very moist, although I could have enjoyed a heavier chocolate flavor. The salted caramel frosting was excellent! It tasted just how I imagine a Werther's would taste as a frosting. The frosting really made this cupcake great. Lovely Confections has my recommendation for anyone living in or visiting the Denver area. Their organic, local, natural cupcakes are high quality and taste delicious. Their regular-size cupcakes are $3 and their minis are $1.50. If you know me, then you know that I love triathlon and sweets. So of course this new race appealed to me: Hot Chocolate 15/5k. 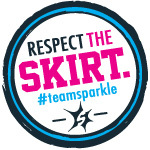 What makes this running race different than any other race? Well, the post-race party has chocolate fondue and hot chocolate from Ghirardelli! I always indulge on sweets after a race, so now I don't have to go searching for any. This race series takes place in 8 cities, so there's a good chance that there will be one near you. The 15k race is $65 and the 5k is $45. I can't wait to run for chocolate next year! Who's with me?